Rare is the person who can refuse a glass of milkshake or smoothie without feeling a twinge of regret! 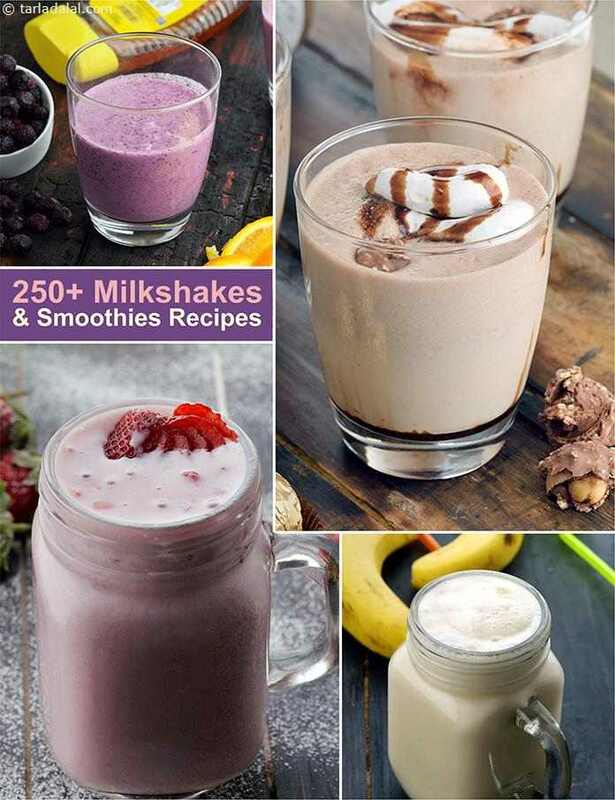 The luscious consistency, chill and creamy mouth-feel and exciting flavours of shakes and smoothies are so enticing that everybody loves them. Milkshakes and smoothies can be categorized as sumptuous or filling beverages. They are not just drinks but beverages that can be had as a snack or a meal itself! Milkshakes are usually made with milk and other ingredients like fruits, nuts or ice-cream. On the other hand, a smoothie is thicker and is made with Curds or Ice-Cream as the base along with a variety of fruits and other ingredients. There is no right or wrong combination of ingredients for milkshakes and smoothies. Working around a base of Milk or curd respectively, you can customize your milkshake or smoothie as per your likes and dislikes. There is a chocolaty shake for the chocolate lover, a fruity one for the fruit freak. There is a creamy coconut milk smoothie for the vegan and a nutty delight for the foodie. As you like it, so you can make it. It can be made as indulgent or healthy as you want, for each age group. Naturally, these beverages are loved by kids and adults alike. Go for your pick of fruity milkshakes like the Chickoo and Nut Milkshake, Mango Milkshake or the Sitaphal Milkshake, or go for an indulgent chocolaty one like the Kit Kat Milkshake with Ice-Cream or the Oreo Milkshake. Couple your milkshake with a Burger or a plate of fries and you have a filling Snack in front of you! A smoothie is the best option when you do not have time for a heavy Breakfast. They are quick and easy to make but quite healthy and filling depending on what you pop into your blender. Try the Almond Banana Smoothie, Melon Smoothie, Mango and Pineapple Smoothie or the Kiwi Smoothie for fruity delights. Or indulge in a smoothie with an exotic international touch like the Thai Smoothie. The most unexpected ingredients can end up making awesome smoothies, such as the Jamun Smoothie. Smoothies and milkshakes are not just beverages served with meals, but can be the meal itself. Make yourself a milkshake or smoothie with lots of fruits for breakfast. You can even have it on-the-go. Or serve a fabulous smoothie to your kids when they are back from school. A shake or smoothie can be had any time of the day! 1. Clean your blender after every use, so that it does not smell bad the next time you make a smoothie or shake in it. 2. Use chilled curds, milk and fruits to make your shake. You will get the right consistency and a vibrant taste too. 3. Go for a good quality blender so that the smoothies and shakes can be made nice and smooth. 4. Always pick fruits that are perfectly ripe. Raw or over-ripe fruits will totally ruin the taste. 5. As milk, curds and fruits are used, it is best to consume the milkshakes and smoothies immediately after preparation. At the most have them within 2 or 3 hours. The world of milkshakes and smoothies is limitless! These are popular all over the world, so in any part of the world if you are hungry, you can rest assured that you will at least get a milkshake or a smoothie to appease your growling tummy. There are some evergreen milkshakes and smoothies, and several innovative ones that can be found on our website, but beyond that there is a whole gamut of unexplored recipes resting in your head, so just unleash your imagination and get going!